Beech View at Nibbs Farm Cottages in Washfield, near Tiverton, Devon sleeps 6 people. 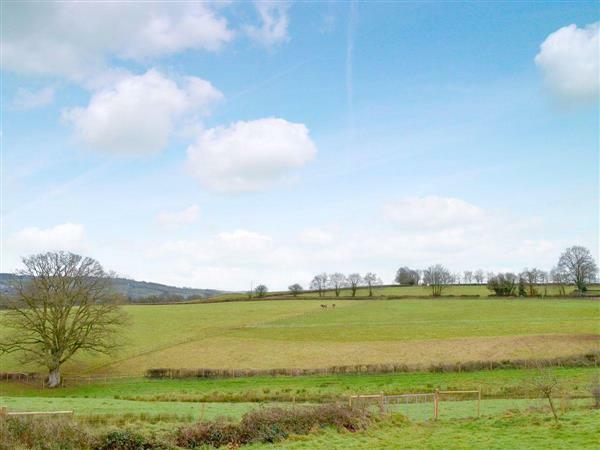 Nibbs Farm Cottages near Tiverton is set in a quiet farm location with far reaching views across the Devon countryside; these two identical, single-storey semi-detached properties sitting side by side and the owners live on site should you need advice or assistance during your stay. The properties (refs UKC2856 and UKC2857 [Oak View]) which were once the barn for the farm, have been transformed to provide two holiday cottages. They can be booked together to accommodate up to twelve guests, and have an adjoining door to make one large property. Each has its own hot tub and private parking and has been tastefully furnished throughout. The cottages are all on one level and offer a patio area each for watching the sunsets and sunrises. There are many places to visit including the Tiverton Canal, home to one of the last horse-drawn barges in Britain. Located in magnificent mid Devon on the banks of the beautiful Grand Western Canal, Tiverton Canal is a truly unique Living Heritage tourist attraction that offers an enjoyable family day out for everyone who loves boats, horses, wildlife and water. Exmoor, with its ponies and deer, is close by, take a trip to Tarr Steps, a great place to walk. There are many National Trust places nearby, and a small railway at Bickleigh is the perfect way to start any visit. There are so many things to see and do and all on the doorstep. The shop is 1 mile from Nibbs Farm Cottages near Tiverton, with the pub and restaurant 2½ miles from Nibbs Farm Cottages. Beech View is all on the ground floor. Both properties: Oil central heating, underfloor electric heating, electricity, bed linen, towels and Wi-Fi included. Travel cot and highchair. Lawned courtyard with sitting-out area and garden furniture. 17-acre grounds and woodland (shared with other property and owner). Hot tub for 6 (private). Private parking for 3 cars. Wheelchair access. No smoking. Please note: There is a fenced stream and a pond nearby. Holidays at Beech View, Nibbs Farm Cottages run from Friday to Friday. For a better idea of where Nibbs Farm Cottages - Beech View is, you can see Nibbs Farm Cottages - Beech View on the map below. Nibbs Farm Cottages - Beech View is in Devon; should you be on the lookout for a special offer, you can find all the special offers in Devon. It's always worth checking to see what is on offer at the moment. Do you want to holiday near Nibbs Farm Cottages - Beech View (UKC2856), you can see other cottages within 25 miles of Nibbs Farm Cottages - Beech View; have a look to find your perfect holiday location.